Preheat the oven grill to high. Place a large frying pan with 15ml (1 tbsp) olive oil over medium-high heat and fry the rump, 5 minutes. Remove the meat from the pan and transfer it to a bowl. Put the remaining olive oil and butter in the same pan, and fry the onion, 10 minutes or until soft and translucent. Return the meat to the pan, mix through, and add the garlic, chilli and rosemary leaves. Fry, 2 minutes, then remove from the stove, add the chutney and barbecue sauce, and season to taste. For the salsa, fry the beans in a pan over medium-high heat until dry and slightly crispy, about 5 minutes. Remove from stove and allow to cool completely. Transfer to a medium-sized bowl, add the remaining salsa ingredients and mix through. Season to taste. 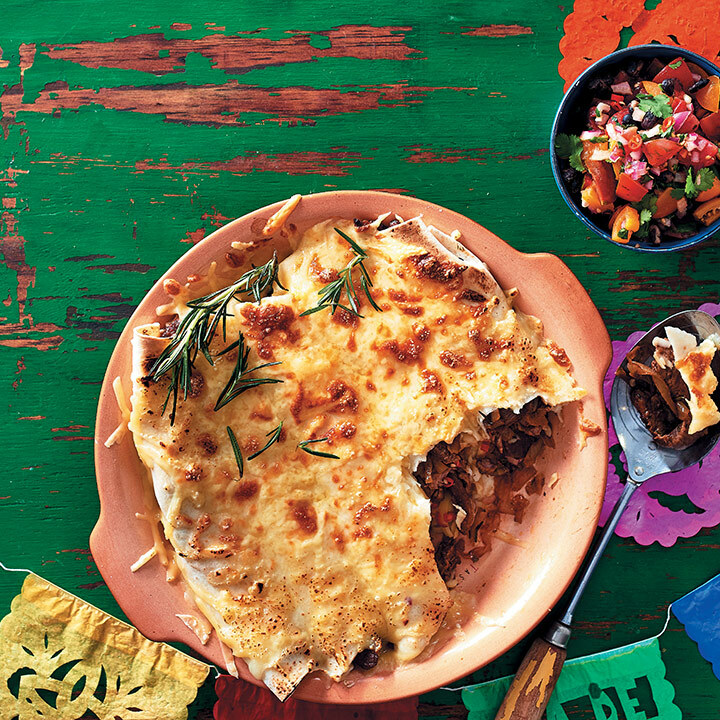 Divide the beef mixture among the tortillas, scatter 4 tablespoonfuls each of grated Cheddar and mozzarella into every tortilla and roll them up to form long tubes. Pack the tortillas together tightly in an ovenproof dish. Sprinkle over the remaining grated cheese. Place under the grill, 5 minutes, until the cheese has melted. Serve garnished with extra rosemary sprigs and the salsa alongside.